Organic sprouting seeds are miniature plants of germinated seeds, and they can either be eaten as raw or cooked. Sprouting seeds are common organic foods in Eastern part of Asia, and they can be grown at any time of the year and with little or no soil and water. 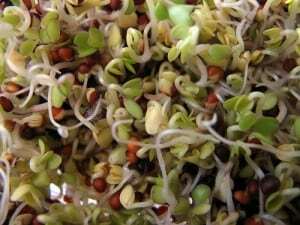 There are wide varieties of seeds that can be grown as sprouts and they include alfalfa, mung beans, sunflower, soy, chickpea, broccoli, radish, pea, and lentil. The main advantage of consuming sprouting seeds as a source of organic foods is because they have significant amounts of highly digestible nutrients, vitamins, and enzymes. Some seeds such as sunflower can be sprouted with or without shells and either way; they provide adequate nutritional value, and they are also delicious. You can also easily sprout the seeds by yourself by putting them in the jar and covering with water to soak for 12 hours and repeat the process for about three days. After this period they will have germinated and be ready for consumption. There are various health benefits that accrue from eating sprouting seeds such as boosting metabolism or digestion process. This is made possible because of the high number of enzymes which are very helpful in breaking down the food particles and easing the nutrients’ absorption in the body. Because of their brilliant functions of sprouting seeds consumption in the digestive system, they are the best foods to avoid constipation as well as prevent colorectal cancer. Organic sprouting seeds are great organic foods to add to your diet for controlling your blood sugar levels by reducing insulin resistance. They are the best diet to be consumed by people with type 2 diabetes. Sprouting seeds are also a good choice to consume as a way of boosting your diet. They contain vitamin C which responsible for stimulating white blood cells and make them more powerful in fighting off diseases and infections. They are also a very good choice for those who are looking forward to controlling the weight due to their low number of calories and also help you feel full and satisfied. Growing sprouting foods are very beneficial as a health boosting diet and also a great way to spend as a family project. It is also a fantastic leisure to spend with your kids while teaching them the importance of consuming nutrient-rich diets. It is also important to ensure that the seeds are certified as organic or consult with dietician or nutritionist to take full advantage of the organic sprouting seeds.